Myer Mizelas appears in the 1901 census as Myer Meisler and in the 1911 census as Myer Myseles. The original spelling may have been Meiseles. (Other variations include Majzeles.) The Ancestry website wrongly transcribes the surname as Meister for the 1901 census. The family were from Austria/Galicia, which in this case probably means South East Poland. His wife's name was Hudja (1901 census). In the 1911 census her first name has been Anglicised to Ada. Her maiden name was Kahana or Cohen. Myer's parentage has yet to be discovered. Ada was the daughter of Isar Ariah HaCohen (Hebrew name taken from Ada's gravestone). Myer and Ada were married in 1894, according to one document in Sterwicz, Galicia and according to another Ztervitz, Austria. This probably refers to present day Shchurovichi in present day Ukraine. Myer and possibly Ada were born there, as was their daughter Rebecca. There is a possibility that Myer was born in Lithuania, as Ada apparently referred to him as a Litvak. The Mizelas family arrived in England when Rebecca Mizelas was about 6 months old - in either 1895 or 6. They list their country of origin as Austria/Galicia, but this could also mean not only parts of prsent day Poland but also the Czech Republic. There were people with the surname Mizelas who give Czechoslovakia as a birthplace, e.g. Paul Mizelas b.1899 who was living in New York in 1940, and also one person from Greece. They lived for a while at the Charlotte de Rothschild Dwellings, Thrawl Street, Stepney, London (also known Rothschild Buildings) [see below]. This was a tenement block originally built to be modern housing for poor immigrants in the East End of London. The disreputable Thrawl Street formed its boundary on the south side, and the even worse Flower and Dean Street was the north boundary. It very soon became extremely run down and was demolished in the 1970s. There is some evidence to suggest that at some time in the 1930s Myer and Ada separated, as they seem to have been living apart. 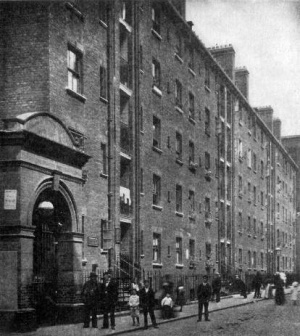 Elizabeth Stride was staying at 32 Flower and Dean Street opposite the Rothchilds Buildings at the time of her murder. Thrawl Street (like Winterton Street mentioned on the Kesselman family page) is another road with a Jack-the-Ripper connection. Mary Ann (Polly) Nichols one of his victims in 1888 had lived at an address in Thrawl street, and was seen there on the night of her murder. *Samuel's son Harry changed his name to Andre Mizelas and became a society hairdresser. In November 1970 aged 48 he was found shot and dead in his Triumph TR5 sports car in Hyde Park. This notorious murder case remains unsolved. Several people were questioned by the police - according to the National Archives website Discovery search engine results, assistance was also provided to the police by actor Richard Burton. Records of his statements held by the National Archives are closed - some till 2039 and others till 2046.